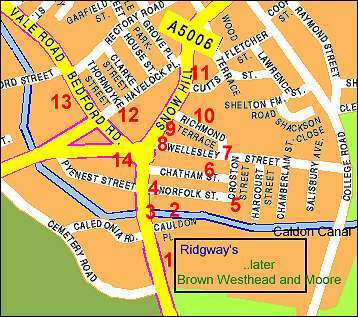 A walk around the Howard Place and Cauldon Place area of Shelton, covering the development of the streets and houses in the area, the Ridgway family and the churches in the area. 1 Cauldon Collage and Ridgways factory. 2 Caldon Canal, the wharf and locks. 3 Shops / houses in Stoke Road. 4 Norfolk Inn, the brickworks and glassworks. 5 Croston Street and its houses. 6 Chatham Street and the alley to Wellesley Street. 7 Wellesley Street and its houses. 10 Richmond Street and the school. 11 Cutts Street and the Bell & Bear. 12 Havelock Place, houses and Ridgway Memorial Chapel. 14 Berks - wholesale grocer and The Elms.